Heat oven to 375°F. Spray 2 1/2-quart round or oval baking dish with cooking spray. In 12-inch nonstick skillet, cook beef and onion over medium-high heat 6 to 8 minutes, stirring occasionally, until thoroughly cooked; drain. Reduce heat to medium. Add frozen mixed vegetables, tomato paste, Italian seasoning, salt and pepper. Cook 4 to 5 minutes, stirring frequently, until thoroughly heated. Meanwhile, in small bowl, mix broth and flour with whisk until well blended. Add broth mixture to beef mixture. Cook 2 to 3 minutes, stirring occasionally, until thickened. Spoon beef mixture into baking dish. Meanwhile, cook mashed potatoes as directed on package. Spread evenly over beef mixture. 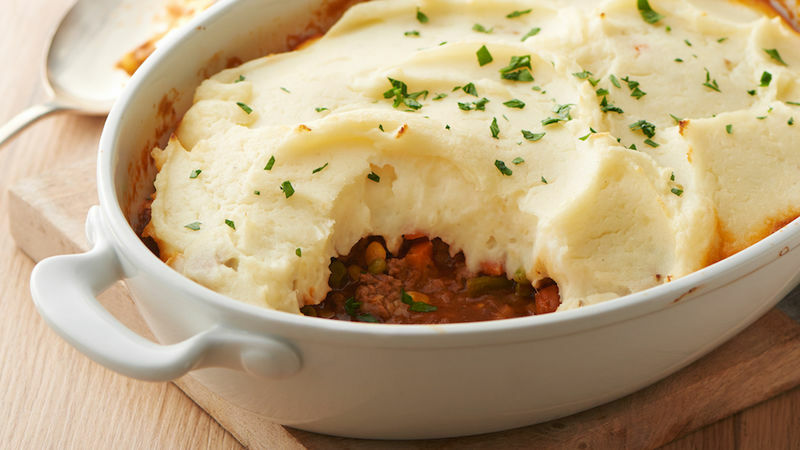 Sprinkle 1/2 cup shredded Cheddar cheese onto mashed potatoes before baking for a cheesy topped Shepherd's Pie. Any flavour refrigerated mashed potatoes can be substituted for the garlic mashed potatoes in this recipe.